The pace of change is so fast, companies can miss out on the incredible advancements in business. 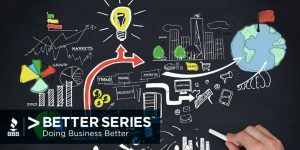 Trend watcher and Author of Trend-Driven Innovation: Beat Accelerating Customer, Maxwell Luthy joins us to discuss the importance of staying on top of business trends. Please take our survey to provide us with your feedback. #GivingTuesday has become a global phenomenon transforming communities and improving lives everywhere. Asha Curran, Chief Innovation Officer for 92Y, chats with BBB Wise Giving Alliance President and CEO, Art Taylor to discuss #GivingTuesday movement and ways individuals can become involved in the process of giving.